W.H.A.T. has been designed to be easy to learn and play. 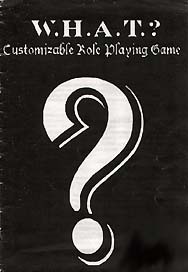 It has a free form system that will allow the rules to be adapted for use in any adventure setting. With a skill based design you can customize W.H.A.T. to meet the exact needs of your campaign. You can even design your own skills and spells using a simple point system, outlined in these rules.